Test the Baerenreiter Study Score Reader App using a free demo version from the orchestral score to Debussyâ€™s PrÃ©lude Ã lâ€™aprÃ¨s-midi dâ€™un faune ! Turn your iPad into a mobile music library for concert and study purposes! You will find the music of the great composers, from Bach to Debussy, in razor-sharp images of the orchestral scores. Do not compromise: feast your eyes on the superb quality of the Baerenreiter editions. Make entries directly in the musical text to create your own personal copies of these masterpieces. No bookshelf space is required: the orchestral scores, including all accompanying texts from the printed editions, will be on your iPad. 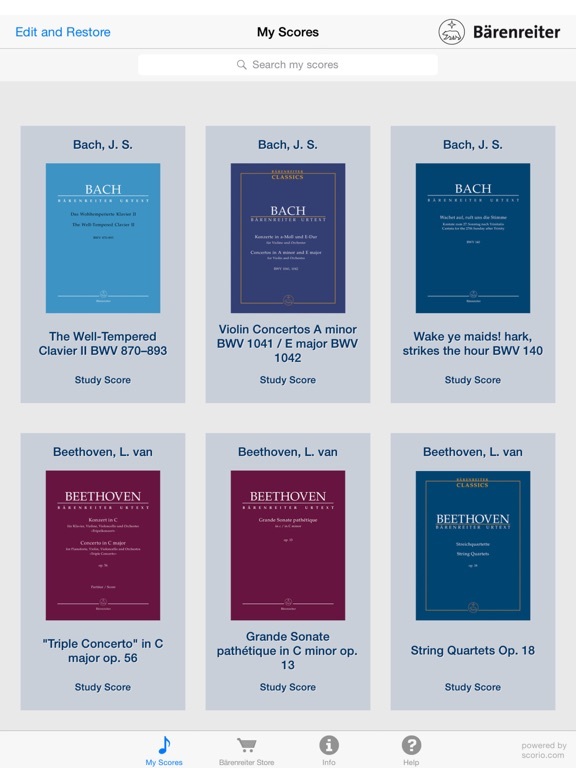 After installing the free app, you will find a constantly growing number of editions in the Baerenreiter Store, all ready for convenient downloading. Many works by Bach, Beethoven, Berlioz, Brahms, Debussy, Handel, Mendelssohn, Schubert and Vivaldi are already available. Once you have downloaded the scores, they are yours to keep: no need for an internet connection to study them.